Aside from the “Chicago” and “Old Royal” edition of the Air Jordan 10, another variation is already trending after images of it surfaced recently. 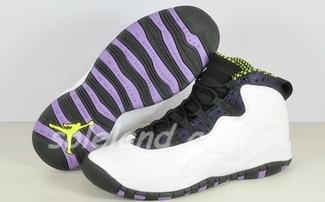 One of the most loved model among the Air Jordan numbered series, the Air Jordan 10 will also be coming out in White/Ultraviolet-Cyber-Black colourway soon. White leather dominates the upper part of the silhouette enhanced with ultraviolet and cyber black accents on the outsole, midfoot, and tongue. No release date as of now, but this one is definitely worth waiting for! Air Jordan 3 Retro “Flip” Due Today!